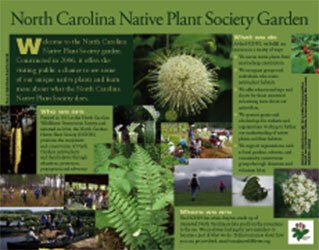 Photo: The NCNPS sign at the Native Plant demonstration garden at the North Carolina State Fairgrounds in Raleigh. Every October volunteers from the Reid (Triangle) Chapter man this garden during the State Fair. Reid Garden is located at 1439 Dixie Trail (SW corner of Dixie Trail and Lewis Farm Rd.) in Raleigh. Monthly nature walk, usually on Sunday, during the school year. Meet at the Reid Garden to carpool at 1:00 p.m. Or contact either Margaret or Amy for directions and meeting time for specific sites. Monthly workdays at the Margaret Reid Wild Flower Garden in Raleigh - 2nd Saturdays September through June, 9 AM-Noon. See Activities section below for more information. Learn about landscaping with native plants, enjoy the company of other enthusiasts, and help maintain this jewel of a native plant garden.